Volvo has always focused on the image that it was more concerned with occupant safety than other manufacturers. The 2007 S80 doesn’t abandon this mantra but attempts to blend in a stronger flavour of premium luxury motoring. Back in 1972 my Dad drove a Volvo 144, a big square box that could very well pass for the shipping container the S80 was delivered in. The new sedan seems so far removed from the 1970’s model, I wonder what my Dad would have thought of this latest offering from Gotteberg? He S80 shows many of Volvo’s corporate design themes but seems to have a far more harmonious effect than anything else they have produced in recent memory. The sheetmetal seems to flow unencumbered from the understated front grille back towards the raked windshield and aft over the stepped rear trunk profile. There is nary a straight line to be found on this vehicle. The increased length over the S60 is most noticed in extra wheel overhangs, which has added a more tailored or bespoke look to the handsome sedan. The interior is pretty much what you would expect in a Volvo and that is good news! The clean and easily identifiable dash incorporates the cascading centre console that Volvo has become known for. The level of finish is without reproach on this vehicle, from the quality if materials used to the quality of assembly, everything lends itself to convincing the occupants that this is Volvo’s flagship sedan. The big news was the addition of the Yamaha made V8 engine as an optional powerplant. This 4.4L all-aluminum engine boasts 311 HP @ 5950 RPM and 325 lb-ft of torque @ 3950 RPM. 0-100 comes up in 6.5 seconds which while not blistering is quick enough to provide an exhilarating ride in a truly refined package with a most un-Volvo like sound growling from the rear dual tail pipes when the engine was powered up. Another feature in our S80 was standard all-wheel-drive (AWD). The system operates in front wheel drive mode until there’s wheel slippage, then power transfers to the rear wheels. A late winter snowfall provided the opportunity to experience the system under load. The reactionary nature of the system provided a noticeable lag in power transfer and really should be called a part-time 4 wheel drive system. When pushed to the limit the system stayed engaged and works like a charm allowing the driver to experience the S80 at 9/10ths of its limits. The S80 feels as solid as any other premium sedan on the road and provides an almost Zen-like feel that Volvo reinforces in their informational brochure provided in the press kits. 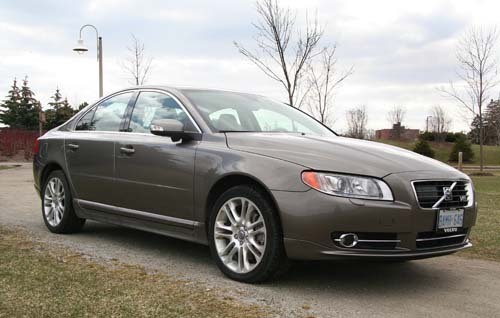 Under normal driving conditions the S80 is quiet, responsive and predictable. AT speed on the highway the level of interior noise is surprisingly low, due to the multiple seals and gaskets in each door frame. Avoiding speeding tickets does require some discipline as the S80 will produce extra-legal speeds without breathing too hard and that’s usually the mark of a true thoroughbred. Tromp on the gas pedal however and the rear tailpipes light up with a sharp exhaust note that screams muscular refinement as opposed to bellowing cubic displacement bulk. Back to that staple of Volvo’s corporate culture. The list of safety features crammed into the S80 could fill the space allowed for this article, so in addition to the requisite ABS, Stability control, traction control and a full compliment of airbags S80 drivers are treated to optional features such as a Blind Spot Information System, Adaptive Cruise Control, Emergency Brake Assist, Whiplash Protection System, Collision Warning System with brake support and Parking Assist. Volvo has done much to bolster the image of the brand as a premium luxury marque. The addition of the V8 engine and the interior appointments are sure footed steps in that direction. Our test vehicle topped out at over $72,000 which encroached on other European luxury marques but the S80 certainly felt the part of a Euro luxury barnstormer. Dad would have found much to love about the S80, I am not sure he would have plunked down $72,000 for it mind you – but that probably had more to do with the fact he didn’t have it in the first place.